A day of Clay Pigeon Shooting will leave you will a real sense of satisfaction and achievement, it’s a sport almost everyone wants to try! 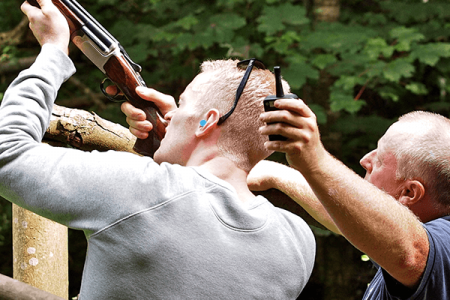 Enjoy a Team Away Day to remember with Clay Pigeon Shooting in Edinburgh. Clay Pigeon Shooting is also a great activity to add on to a Mini Highland Games session, an afternoon with a fun competitive edge to keep the whole team exhilirated. “Started the day on the quad bike course which is brilliant fun. We then headed over to do some clay pigeon shooting, target practice with air rifles, archery, and then rounded the day off with the mini highland games. Turned out to be really competitive in the end and great fun. I would definitely recommend this as a team building day out or even for a stag or hen party." Experienced Instructor, Shotgun, Ear Plugs, 25 Clay Shots, £10 million public liability.